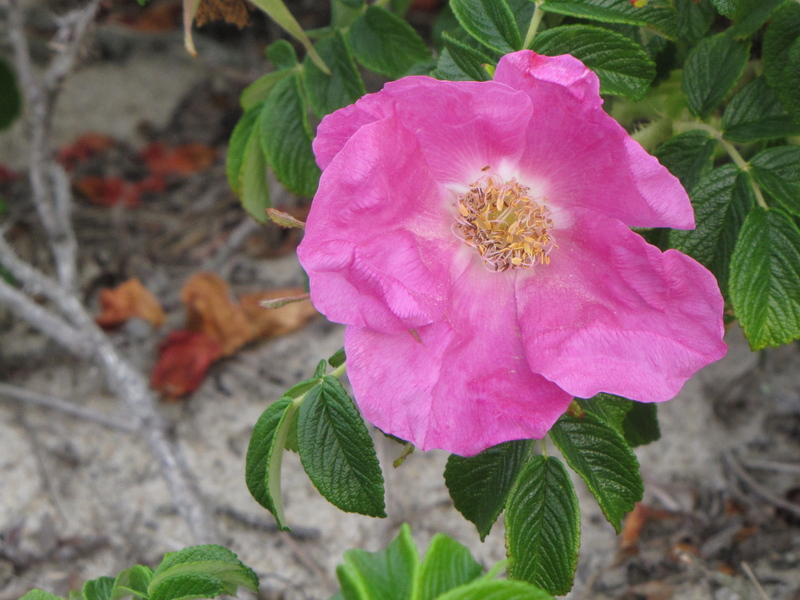 THE PINK AND WHITE beach roses, Rosa rugosa, are heavily in bloom, the air thick with their perfume as you pass near them, as you are bound to do twice on the path from our door to the beach, about a five-minute walk from the north-facing shack (the sun rises and sets over the ocean). A broad thicket of roses drapes over the ridge 20 feet from our door; another hangs precariously from the flat face of a dune rising from the base of the beach. The dune grass bends and glistens in the wind. A band of it 30 yards wide or more interrupts the sand and stretches east and west between the shack and the beach. Its color is highly variable; depending on the time of day, it runs from lime to bluish-green, with accents of silver or gold. Only the ocean, with its browns, purples, grays, greens and myriad shades of blue, reflects more colors. A number of boats already are visible by 6 a.m., plus the loud rumble of an engine that gradually fades eastward, out of view. To the west, on my left, a sailboat silently plies the waves, and two small fishing boats skip across my view, like father and son. An airplane drones overhead, unseen. There is not a cloud in the powder-blue sky. Some distance from the shore, great hosts of seagulls dot the waves for much of the day, leaving jagged, whitish patches and the impression that there is some source of easy food drifting by just beneath the surface. The beach is animated as always with tern action: squawking, diving, darting, emerging from the sea with sand eels glinting from their beaks, nesting in cordoned-off spaces in the hot sand bordering the dunes, which they share with piping plovers. The ring-necked plovers, legs whirring, skitter up and down the beach, always watching, occasionally chirping. It is both a state and federal crime, the signs say, to disturb their nesting. Back at the shack, a mouse walks boldly out from behind the dish drainer in broad daylight until it sees me sitting at the nearby table, then hastily retreats. We saw our first evidence of mice last night, as a roll of paper towels was pulled into the sink and shredded for a nest (later discovered behind the wood stove), the mouse ignoring the single curling strand of pasta, a straggler from dinner, clinging to the porcelain. There are daily shack rituals like sweeping the floors of sand, checking for ticks (happily we found none) and filling plastic gallon jugs with rust-colored water from a pump at the base of a dune at the end of a winding path through and beyond the rose thicket. Then there are the rituals we brought here, that keep us from totally forgetting ourselves: toothbrush and floss, and a litany of pills—flaxseed, calcium, glucosamine with breakfast, aspirin at night. Through these, continuity and equilibrium are maintained. 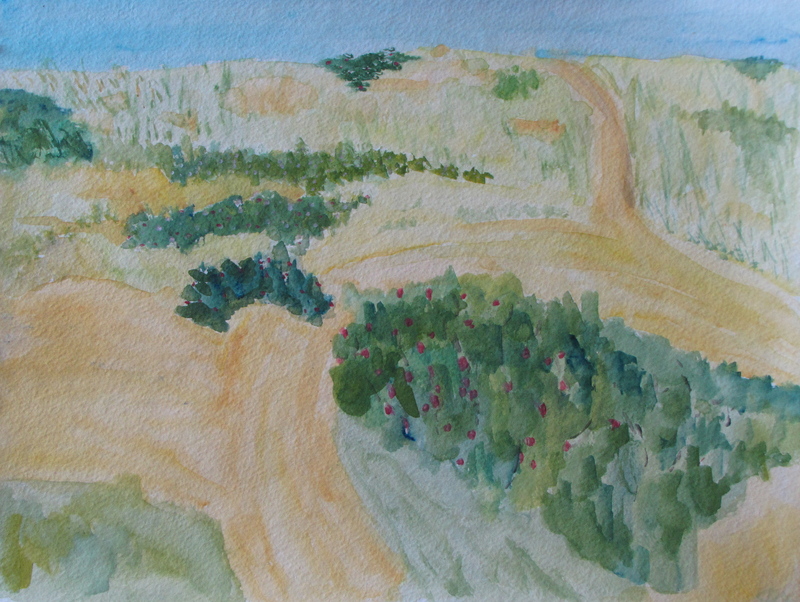 This entry was tagged artist shacks, Cape Cod dunes, dune shacks, Provincetown dunes, Rosa rugosa, Russell Steven Powell. Bookmark the permalink. Back in the mid-1970s when Hazel Hawthorne Werner was still living, I used to spend one or two weeks each fall at Euphoria. Also spent somc time in Peg Watson’s in the winter. Good to find you here. Thanks Dan. Glad to hear from you!